I have made no secret of my joy at Almond Breeze reaching Australia last year. Their unsweetened almond milk took me from someone who drank, perhaps, 500ml soy milk in a week to someone who is getting through 2L of almond milk in the same time frame. You may imagine my dismay, therefore, when I read Angela's recent post on carrageenan over at Oh She Glows. Like Angela, I hadn't given any thought to carrageenan before having its possible effects pointed out to me. And like Angela, I was horrified to discover that it is used in vegan and organic foods (as well as non-vegan and non-organic ones) despite controversy over whether it is safe for humans to consume. Carrageenan is derived from red seaweed and is used as an emulsifier and thickener in many dairy and dairy replacement products. Carrageenan has two variants: a low molecular weight, "degraded" form and a high molecular weight, "undegraded" form. Degraded carrageenan is indisputably a carcinogen in rodents, and has been found to trigger inflammation of the colon in rodents in a way that mirrors irritable bowel disease (IBS) in humans. Undegraded carrageenan does not have these harmful effects, but every tested sample of undegraded carrageenan has had some level of contamination by degraded forms of the substance. In some cases this level of contamination reaches 25%. In light of (3) and (4), there have been suggestions that humans with IBS avoid all forms of carrageenan. I don't have IBS, but I am still going to be avoiding carrageenan from now on. I am thus quite devastated that my beloved almond milk has carrageenan listed in the ingredient list. Unfortunately, all forms of Almond Breeze milk (at least those distributed in Australia) include carrageenan. I sent an email in to the company to express my dissatisfaction over their use of the ingredient, but haven't received a response and don't really expect to. I also found it particularly unfair that I discovered carrageenan in Almond Breeze products the very same week I discovered chocolate almond milk at the supermarket. Update, 16th April 2013: I received an email in response to this post from the Australian Director for Blue Diamond Almond Breeze. He kindly took the time to explain the safety of food grade carrageenan, but the fact remains that food grade carrageenan is often contaminated with degraded carrageenan. After an email exchange on that issue, he indicated that he would read more on the topic and discuss with his American colleagues. It's not often I have that level of interaction with a company and whatever the outcome from here, I am delighted that they are at least considering their use of carrageenan and that they took the time to email me. Can you spot the problem ingredient in the ingredient list below? Carrageenan: third line of the ingredients. I drank the above anyway, supposedly in the name of research, but my enjoyment was certainly compromised by new-found awareness of the ingredient list. This was a pity, because the milk could have been delightful - full-flavoured chocolate, sweet without being sickly, and creamy without being 'milky' in a traditional sense. Alas, I moved on and have now crossed Almond Breeze off my drink list. This left me with the task of finding a replacement option for my coffee, and to a lesser extent smoothies and cereal. Initially, I thought I'd jump to Australia's Sanitarium So Good unsweetened almond milk. Sadly, they too include carrageenan in the ingredient list. There is no carrageenan in the sweetened Sanitarium almond milk and so that is what I have been using over the past few weeks. As of mid-2013, there is also carrageenan in the regular, sweetened Sanitarium almond milk. I then thought I would return to the unsweetened So Delicious coconut milk I reviewed in December 2011, but alas! It is no longer in any supermarkets near me, including the one I found it in back then. And also! It has carrageenan in it too. This week I switched back to soy milk and tried Vitasoy's Vita Cafe low fat soy milk. It has the advantage of coming in regular 1L cartons and 3-packs of smaller, 240ml tetrapacks. The latter are useful if you aren't sure if you'll like the milk, and/or want to take it to work. I did actually like this, and it has been working in my coffee, which is something I've struggled with when using soy milk in the past. (I think my discovery of how to heat milk, and the need to use a reasonable amount of milk, may have helped with that.) At the same time, I would rather be drinking nut milk. I get enough soy in other forms. Update: See my note at the bottom of the post regarding carrageenan actually being included in this milk, but listed in the ingredient list as vegetable gum 407. This return to milk frustration led me to try my hand at milk making once again. I haven't done much since I made hemp seed milk last November, largely because I have been happy with Almond Breeze. This time around, I tried cashew milk, because I had cashews sitting spare and I don't much like them on their own. This is a 'thin' milk, similar to low-fat or non-fat dairy milk in texture. If you like creamy milk, use less water to nuts or more nuts to water. Soak the cashews in the 3 cups of water for 4 hours, or longer, in the refrigerator. 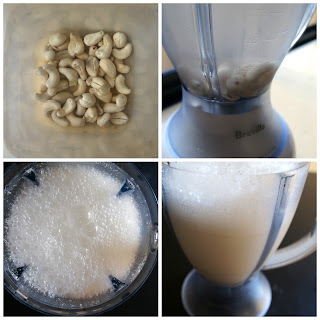 Transfer the nut/water mixture to a blender and process until creamy, about 30 seconds. Strain the mixture through a nut milk bag or cheesecloth, and store in the refrigerator for up to 3 days. Retain the nut 'pulp' left after straining for use in baking, if desired. It's a magical process, milk making. As with homemade hemp seed milk, I liked the experience of making this and I liked the result. The consistency was about right for me, it was satisfactorily not sweet, and it worked fine on cereal and in coffee. The downsides of the homemade route are that it will only last a few days, it's a bit harder to take a container into work for the week, and you don't get the added calcium that comes with commercial non-dairy milk varieties. At this point, I don't feel like I have hit upon a 'perfect' replacement for Almond Breeze. I am keen for more non-dairy and non-carrageenan options to hit Australian shelves. I have also updated my non-dairy milk comparison spreadsheet to include a column for whether or not carrageenan is present, and to incorporate chocolate Almond Breeze and VitaSoy vita cafe. I am repeating it below to highlight just how many milks do include carrageenan. Update: Thanks to Mel from Veganise This, I know now that VitaSoy vita cafe does include carrageenan, but it is listed as vegetable gum 407. I am quite horrified by this. I have double-checked the other milks I've listed below as not including carrageenan, and they don't have carrageenan or vegetable gum 407 listed in their ingredient lists. Submitted to Healthy Vegan Friday #34. Before I even commented I had to check on the soy milk that we drink (vitasoy calci plus) - I think we started to drink it because Sylvia took to it and it had extra calcium and B12 but now she is very fussy about any other milks. I did look at other sorts of milk a while back and they didn't seem to have satisfactory dietary supplements. So I am very relieved that it doesn't have carageenan. That said, I have never found a milk I would want to drink so I am not fussy about what I put in smoothies and baking. That sounds so annoying to find that your favourite milk is made of horrid ingredients - hope you find another one that you like. I have heard of carageenan before - it is disappointing that manufacturers are still adding it to food despite the evidence - is there nothing that can be used in its place or is it really cheap? There are other things that can be used in its place, although I'm sure they all have relative pros / cons - it's one of the various vegetable gums used and the others don't have known health consequences, so it does seem frustrating that they can't / won't just use a different type. The skeptical part of me thinks it must reflect price! I just checked your VitaSoy calci plus after Mel's comment below made me realise that carrageenan is sometimes listed as vegetable gum 407...yours does seem to be a good option and one I may look into, especially with the added calcium and B12. All of the vegan cheeses I eat every now and then list carrageen as an ingredient! I've been using Vitasoy Soymilky in coffees and Vitasoy Hi-Fibre for smoothies and cooking for a while now. The latter doesn't appear to contain carrageen but Soymilky does (on the packet it is listed as Vegetable Gum (407). I'm going to look out for VitaCafe variety, did you find it in a regular supermarket? Before reading this I was actually going to hunt for carrageen as an ingredient to use in cheese making, plenty of the recipes in Artisan Vegan Cheese call for it! Mel, your comment gave me mild heart palpitations! I am embarrassed to admit I didn't know that vegetable gum 407 equated to carrageenan. It is included in the Vitasoy VitaCafe milk, I just hadn't realised it. I've updated the above to reflect that and am now feeling even more bereft as to what milk to use. Thanks for alerting me though, I would have been even more horrified if I'd discovered it after drinking Vitasoy instead of Almond Breeze for several months first! The fact that the 407 is listed amongst a few vegetable gums in VitaSoy's products makes me think it would be present in lower levels than in Almond Breeze, but the problem is that there is no real way to know - just like there's no way to judge the level of low-grade contamination that makes me wary of the substance. I'm glad it was helpful Brandi. It does sometimes seem like it's very hard to make informed choices when even natural products carry concerns that we aren't necessarily aware of! Oh no, its so hard to find anything that is pure. especially things in the "healthfood" area. It makes you feel a little scared doesn't it? It does. It does indeed! Absolutely. I'm so sorry to add something to your list of things to worry about! The use of carrageenan is so sad to me. I mean, now a days is any product really safe?? I want to try making my own milks. I too saw the post where Angela made almond milk and i really want to give it a try. It does seem hard to find easy, reliable, good-quality products sometimes. It shouldn't! I hope you enjoy making almond milk yourself if you try it - I am not sure if it's a sustainable approach for me (with time and it only lasting a few days) but I do find it really enjoyable and it is easy. I drink Silk almond milk these days which, to my knowledge, doesn't have carrageenan in it...and I also started drinking cow milk again. this carrageenan business is gross! I have been contemplating cow's milk again for that reason. Or going to black coffee...but I don't think that's an option! I'm glad to have helped, even if the cashew milk recipe came amongst depressing news regarding Almond Breeze! I love vitasoy organic milk (green bottle), it has 'gum arabic' (i have no idea what that is) but doesn't say 407???? why do food numbers and labels have to be so confusing?!?!?? I have no idea Sandy, but I'm sure they shouldn't be so confusing! Gum Arabic is known to cause skin rashes in sensitive individuals and asthma. Check out additive alert. They have phone apps, websites and a book. Great reviews! I love almond milk but have never tried cashew milk, thanks for the recipe! Have you tried the Australia's Own Organic Almond milk?? I picked it up from my local Coles the other day and the ingredients are listed as filtered australian water, organic almonds, organic agave syrup, organic sunflower oil, salt. Would prefer the agave and oil not to be there, but it's not too bad and taste wise pretty good too. Yeah agreed - I think it's about 4.8g/100mL which is around the range I tend to look for, but actually do prefer the unsweetened versions better. There also used to be a Pure Harvest brand I think that made Almond milk that I saw a few times at Woolies/Coles - but they don't stock it anymore. I know they make oat/rice milk. Really interesting post, thanks for sharing - I didn't know about the carrageenan. Thanks, as always! I knew nothing about carrageenan!! :0! So scary that these products are freely available :0! Great story! It really is scary...I wish I stopped making these kind of discoveries! I love your milk review chart! I might just have to make one myself to compare the milks we get here in the UK. I use quite a few different milks (soya, almond, oat, hemp, coconut) but I've yet to have a go at making my own. I'd heard rumblings about carrageenan in 'blogging world' but have yet to read the published studies myself. I don't think it's in the milks we use, but I'll double check. Great post! I now stick exclusively to brands that don't have it as well because I have a very fussy digestive system, or of course, I make my own! I hate how you can't trust anything in our food system these days, even the supposedly "healthy" and "ethical" foods! I hate it too. It's really terrifying in fact! Thanks for a VERY informative post - news to me! I think of all the friends I have who eat commercial ice cream or other foods with carrageenan and have chronic digestive issues. I wonder how many of them are victims of this stuff! It's scary, isn't it? I hate how hard it is to realise these things too, it takes conscious digging to actually discover much of this information! OMG, I have just been using this Almond Breeze milk the last fwe day,s, and have been very dizzy! And wondered why? I eat very healthy food! So I checked the ingredients in the milk and saw Carrageenan! Never heard of this before! So I googled it, and found your review! This is very scsry stuff! So now I will go back to So Good Soy Milk! Is there anything we can buy that doesnt contain these terrible aditives? Thank you for all this information, most helpfull, I am tipping the Almond Breeze milk down the sink now! Just checked my milks, some of your information aren't correct. So Good almond milk has carrageenan as well, with 75mg of calcium per 100ml and 3.5g of sugar per 100ml. Almond Breeze original almond milk has 75mg of calcium only per 100ml, not 120mg. But still, thanks for posting this, now I'm aware of carrageenan. Thanks so much for your comment. I was confused about why you had different values, but on my newest So Good Almond milk, you are absolutely correct - they now have carrageenan and have increased the calcium. I guess they changed the ingredients! I'm pretty horrified by that and now wonder just how often I have to check ingredient lists to see if things are changing... Anyway, thanks for alerting me to it. Hi there, I just checked my various Vita-soy milks and it appears none have it. Here are the listed ingredients in Vita-soy Calci-plus in case it's masked by yet another name: filtered water, organic white soy beans, pearl barley, barley malt, raw sugar, sunflower oil, minerals (calcium Phosphate, calcium carbonate), sea salt, vitamins B2, B6, thiamin, Vitamin A, B12, and D. I *think* it's clear? Thanks KP - that's great to know! I have only used the vita-soy 'soy cafe' and that does still list vegetable gum 407, which is carrageenan. It sounds like some of their other milks don't have it, which is great. This is a highly biased opinion about carrageenan. Since most people doesn't know that carrageenan is made from edible seaweed, then people should just stop eating seaweed based products, such as sushi or whatsoever, since they have a similar chemical composition. Degraded carrageenan is referred to as poligeenan, which is a carcinogenic. But food grade carageenan has none of these. There are many articles out there saying that carrageenan is not safe for consumption or whatsoever, but mostly these articles are just made to confuse people (or promote non carrageenan products since its becoming less and less popular nowadays). It will be almost impossible to remove carrageenan in the near future in food processing because it helps to improve foods in many ways. Thanks for taking the time to share your thoughts. I actually think we have quite similar views on this. As you note, there are no risks or problems with food-grade carrageenan. The point I was trying to emphasise above (see number 4 of my numbered list) is that all food-grade carrageenan samples tested, to date and to my knowledge, have had some quantity of the 'degraded' carrageenan. As you acknowledge in your comment, degraded carrageenan is recognised as a carcinogenic. There are many animal studies linking it to cancer or gastrointestinal problems. If we don't know how much degraded carrageenan is in the food-grade carrageenan used in our food products, which seems to be the case at present, I would prefer to avoid all carrageenan to avoid exposure to a known carcinogen. If you are more confident in the contamination of food-grade carrageenan with degraded carrageenan being small enough to not matter, that's great. Frankly I wish I could buy almond milk that was only almonds, water and vanilla flavour, with as few additives and stabilisers as possible and no sweeteners. This seems impossible in AUS at the moment but I live in hope. This is an astounding post I seen because of offer it. It is truly what I needed to see trust in future you will proceed in sharing such a great post.